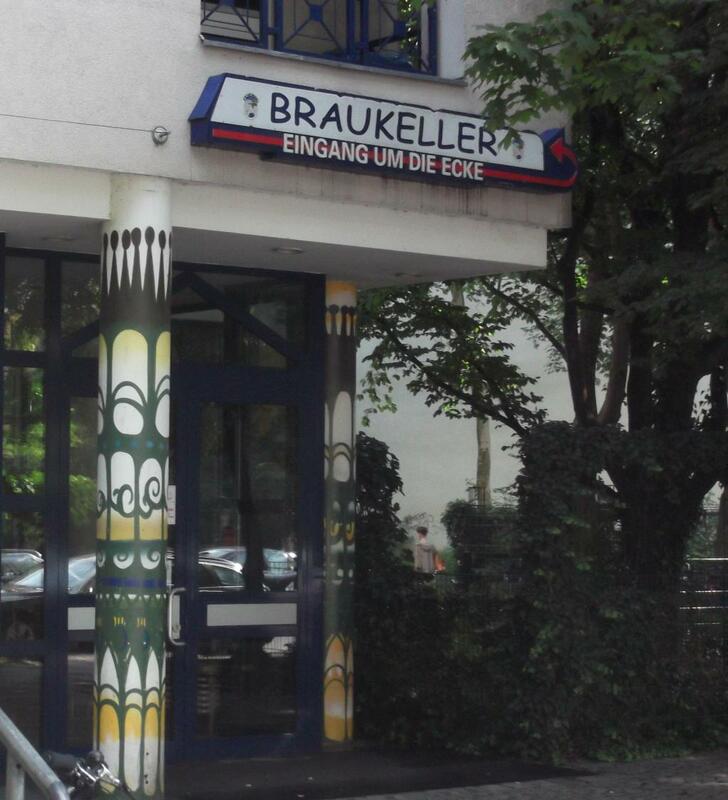 As with the rest of Germany, brewpubs are popular in Berlin. And while many offer a yawn-inspiring range of craft-Pils and maybe one other, quite a few of them are rather more innovative. This is an area where northern Germany* scores over the stick-in-the-mud south. Yes, the south has some great beer, especially in Franconia of course, but it is also quite resistant to new ideas. Even those southern breweries that want to do something new or different have to do it mostly for export - shipping it north also counts as export, of course! 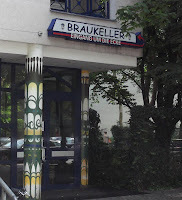 So while we were in Berlin recently, I took the opportunity to visit a few of the brewpubs. It wasn't meant to be a representative sample, but I was hoping to get an idea of how Berlin's brewing culture is regrowing, and how much interest there is in the northern beer heritage. *Here I'm thinking not just of the coastal states that Germans think of as "Nordisch", but Sachsen-Anhalt, Brandenburg and maybe NRW too. This was my first port of call, not least because it opens earlier than most of the others – but then it closes earlier too, because it keeps shopping hours. That's because it is on a small site in an old Berlin market hall, now revamped with a foodie arts and crafts edge, though still with quite a few traditional stalls too, such as old-fashioned butchers, cheesemongers and greengrocers. It's designed to look sort of pubby, I guess. The bar surrounds a windowed but roofless mock building facade just over 2m high, behind which is the brewery. There are only eight or 10 seats at the bar, but there are more tables and chairs nearby – these seem to be shared with the food stalls. Typically it has four or five own-brewed beers on tap, plus more available in bottles. They include the inevitable Pils plus other styles both German and foreign. Interestingly, the non-German styles I tried – Berlin IPA and Bellevue Red Lager – came out almost as hybrids, with notable German characteristics. An illustration of how styles overlap and merge, and how brewing foreign beers is also encouraging German brewers to explore their own beer preferences and heritage. At the street address there is just what looks like an office block. Look again though and there's a sign, “Brew-cellar entrance around the corner”. Ah-ha! Head around the corner, then between two garden fences, look carefully, and finally there it is: gleaming copper brewing gear behind glass upstairs, and stairs leading down to a basement. Formerly a brutalist concrete space by the look of it, this basement is now a warren of rooms, decorated with cartoon murals and filled with tables – and also, on this Friday afternoon, with thirsty and hungry patrons. Three or four regular beers are on tap alongside at least one special. The specials are a mix of Bavarian bierkeller standards, other traditional German styles, and German twists on English styles such as Porter and Stout. All are flavoursome, at least a bit unusual and northern in style, and most are fashionably hazy or cloudy. The place also presses and sells its own apple juice, makes schnapps, and is maturing its own whisky in oak casks, which should go on sale towards the end of 2013. Outside in the courtyard between the apartment blocks is a big beer garden, under a big spreading oak tree and a stand of tall London planes and sycamores. Again, it appears popular with locals, and there's a villagey feel about it. OK, this one's really hard to find! The street address is a scruffy gateway which leads to a post-industrial wasteland, littered with temporary fencing and rubble, beyond which are what looks to be an old red-brick power station (but which I'm told is the original Berliner Kindl brewery!) undergoing renovation and a couple of huge tin sheds, one housing a go-kart track. But if you keep going, around the corner of the power station is the Rollberger brewery and its brewery tap. Sadly it's one of those venues that persists in allowing smoking even indoors, and it was unpleasantly fuggy with just one or two people visibly smoking. Fortunately there is space outdoors too, the sheds partly screened from view by wild flowers in boxes and chicken-wire fencing with vines growing on it. Very inner-city garden. 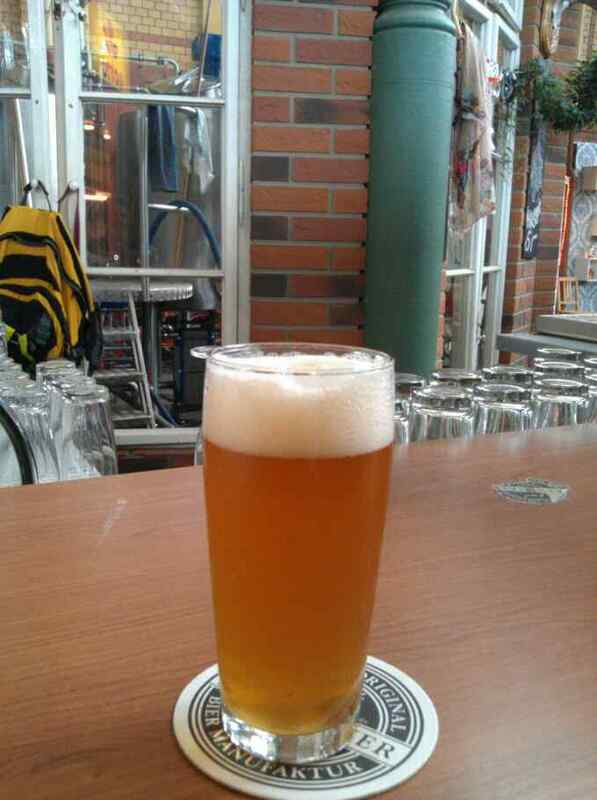 The Rotbier is soft and malty, a bit sweet but still a pleasant interpretation of a Vienna lager. The Maibock however was too sweet altogether to the extent that I couldn't finish it – a rare occurrence indeed. The nice touch about this place is the barbeque – apparently the idea is you can bring stuff along and grill it while you drink. There's an excellent beer-garden rule in Germany that patrons can bring their own picnics, but I've not previously seen one that lets you cook them as well.